That is no surprise to Annette DeVita-Goldstein, senior vice president of global marketing at Kiss Products. Over the past few years, she’s seen growing acceptance of consumers who don’t mind faking it when it comes to talons and lashes. This week Kiss unveils its arsenal to keep sales extending, even as some new contenders eye the market. The major debut is called Masterpiece, a collection the company calls the most “luxe” to date. The goal is to offer an alternative to time-consuming and pricy salon manicures. “Premium manicure services are on the rise in high-end salons. These customized, highly designed manicures can cost close to $250 at a salon and take upward of three hours to create,” DeVita-Goldstein said. Each kit comes with 30 nails including 12 accent nails. Masterpiece is offered in coffin and stiletto nail shapes with styles including jewels and diamondlike crystals, chrome and fine gold-leaf designs all sealed with a top coat to resist scratching and provide luminosity and durability. There are four designs priced at $11.99. Under its ImPress franchise, the company is also launching its next generation technology, Ultra-Fit Design. It delivers a slimmer, snugger fitting, yet stronger nail plus six new styles. In lashes, DeVita-Goldstein said mascara is no longer enough. “Women want more volume and length and it simply cannot be achieved with mascara," she said. The market continues to be propelled by mink-style lashes, DeVita-Goldstein said. 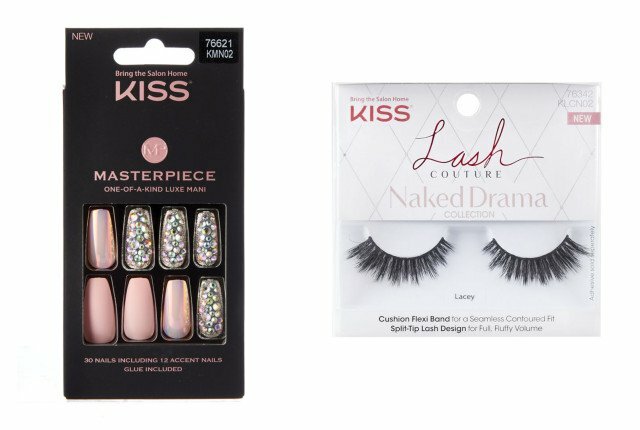 To that end, Kiss is deepening its reach with the introduction of Lash Couture Naked Drama that augments its Lash Couture Faux Mink collection. “Women seek density and fluffiness, but want the lash to blend seamlessly with the shape of their eye and to be virtually undetectable and super comfortable. That is what we have done with our new lash. It has a cushion flexi band made of silicone material that completely contours to the shape of your eye and hugs the lash line for a custom fit. The band becomes invisible and feels weightless on your eye,” DeVita-Goldstein said.